So, are Apple AirPods waterproof? Here is a water and drop test of AirPods showing the durability of Apple’s new truly-wireless wearable earbuds. What is the first thing that you want to do whenever a company like Apple finally makes a highly-anticipated product available for sale? Do you purchase it and enjoy all of the benefits that the product brings? Or do you become one of the first to grab the new hardware and then try your very best to destroy it in as many imaginative ways as possible? In the case of Apple’s new AirPods, and one particular YouTube channel, it’s most definitely the latter. Apple and consumers will be glad to hear that the results are overwhelmingly positive. Whenever Apple, or any other company for that matter, releases a new product, like a smartphone or the aforementioned AirPods, the general public generally asks the same question; is it waterproof? Or at the very least, water resistant? Where the AirPods are concerned, Apple doesn’t officially claim that they are waterproof, and as such, would therefore probably recommend that they not be purposely submerged in water. 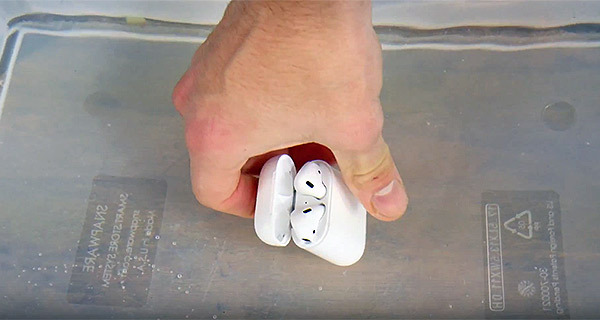 However, in the name of science and consumer trust, the video embedded below shows the AirPods not only subjected to a drop test durability, but also being submerged in water and even put through a detergent-laden washing cycle. And the results? Well, it seems that the AirPods are not only beautiful, but surprisingly resistant to impact and water damage to the point that they just keep on performing with only a small amount of surface and superficial damage after all of the tests have taken place. As is generally standard with drop tests, the AirPods were dropped from waist and head height, as well as 10-feet to see what the results would be. After falling to the ground and bouncing around for a while, the hardware suffered some scrapes and scratches, but nothing surface affecting, and certainly nothing that stopped them from working. Perhaps more astonishingly, the AirPods also managed to survive a 30-minute jaunt in the washing machine, which is actually a very interesting and potential real-life test considering there’s a very real possibility that the little AirPods could get left in a pocket and inadvertently put through a wet, soapy cycle. Check out the video for yourself embedded below and see what you think. Does this relative indestructibility make you want to purchase the AirPods? That was surprising. Very durable. Just got mine (and a second set as a gift for a relative) today and I was wondering, thanks for the info- really helpful and even more pleased I got them now!